Wet savannas, sandhill seepages. Rare in NC Coastal Plain. 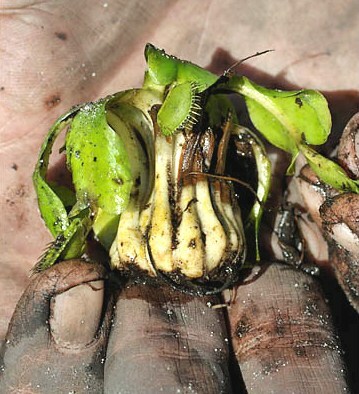 This carnivorous plant is endemic to an area in about an 80-mile arc around Wilmington, NC. It is frequently poached and sold to people who have very misguided perceptions about how the plant grows. Consequently most die. You will find them in acidic, sandy soil that seems very dry but the water table is not far below the plant. They will die in continuously wet conditions. This plant was confiscated from a poacher in NC and has been replanted into a protected area. Note: About half of this plant is underground so the root system is an inch or less below ground.